"Originally, Moscow had called for political settlement to be synchronized with Russian troop withdrawal; but it then increased its demands step by step. Instead of withdrawing the troops, Russia wants them to stay on, re-designated from peacekeepers to peace-guarantors, if and when a political settlement is achieved. Moscow would accept a cosmetic internationalization of the troop contingent in return for OSCE legitimization of it. And it would insist (with Ukraine in tow) on 'participating in it actively' so as to minimize international participation in such a contingent." Not mentioned is that in 2003, the Moldovan government suddenly backed out of a Russian-brokered agreement, which included the eventual withdrawal of Russian forces from Pridnestrovie (Transnistria). The Moldovan government's sudden rejection coincided with the stated opposition of the agreement from some leading Western governments and Moldova's political opposition. Since 2003, there are several noteworthy occurrences that have some relevance to the matters relating to the former Moldavian Soviet Socialist Republic (SSR) and the other disputed former Communist bloc territories. · Following Pridnestrovie's 2006 referendum, Kosovo, South Ossetia and Abkhazia have received some international recognition of their stated independence. · When compared to his predecessor Victor Yushchenko, Ukraine's newly elected President Viktor Yanukovych appears more willing to sympathize with Pridnestrovie's concerns. Much of the English language mass media coverage of the former Moldavian SSR continues to not address a number of pertinent facts and fact-based opinions. In relation to history and human rights, Pridnestrovie can reasonably claim that it has a better independence claim than the other disputed former Communist bloc territories. Realpolitik (the views of the major powers) has shortchanged Pridnestrovie's independence desire. It is not in Russia's interests to upset the Moldovan government to drastically undertake policies more distant from Russia. At the same time, some influential elements in the West are apprehensive about recognizing the independence of a Russocentric-leaning disputed territory. Moldova remains unable to govern over Pridnestrovie. Pridnestrovie's government appears to better represent Pridnestrovie than Moldova's government. Moldova desires Pridnestrovie and not the opposite. Pridnestrovie is not like North Korea to the point of being able to successfully intimidate a popular movement in support of the disputed territory becoming a part of Moldova. The recent meeting between the Russian and Ukrainian presidents restated support for the former Moldavian SSR existing as one nation. One idea for settling the former Moldavian SSR dispute takes into consideration such examples as how New York is not a part of New Jersey and vice versa, while both are in the same nation. As is true with some other issues, there has been mud slinging on the subject of the former Moldavian SSR. This manner can draw attention away from key variables. 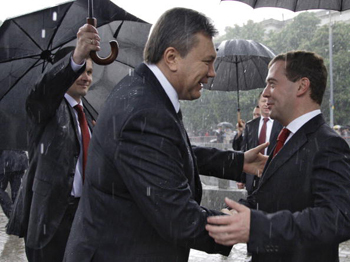 There is a claim making the rounds about a secret agreement between the Russian and Ukrainian presidents. The Ukrainian government denies the claim that Ukraine has plans of taking over Pridnestrovie with Russian approval. This particular claim adds that such an occurrence would pressure Moldova into having a closer relationship with Russia. Logistically, putting Pridnestrovie in Ukraine is not so problematical. There are some other things to consider. Despite wanting to be on better terms with Russia, Ukraine also wants good relations with the West. This hypothetical move would put both countries on rough terms with the West. Regarding Russia, just how easy would it be for Russia to then move on Moldova as claimed? Moldova would not be in a particularly good mood to come closer to Russia under such a scenario. Moreover, Russia-unfriendly folks in the West would gladly tap dance on such an occurrence. Pridnestrovie's 2006 referendum result supports independence and an eventual reunification with Russia. Michael Averko is a New York-based independent foreign policy analyst and media critic. This article was originally published by the American Chronicle: www.americanchronicle.com/.